Not to be confused with AVI, AVC1 or VC-1. For other uses, see AV1 (disambiguation). AOMedia Video 1 (AV1) is an open, royalty-free video coding format designed for video transmissions over the Internet. It was developed by the Alliance for Open Media (AOMedia), a consortium of firms from the semiconductor industry, video on demand providers, video content producers, software development companies and web browser vendors, founded in 2015. The AV1 bitstream specification includes a reference video codec. It succeeds VP9. It can have 20% higher data compression than VP9 or HEVC/H.265 from the Moving Picture Experts Group and about 50% higher than the widely used AVC. AV1 was announced with the creation of the Alliance for Open Media on 1 September 2015. This was at the time when HEVC was 28 times as expensive as AVC, due to HEVC Advance's initial pricing. A common view is of AV1 as an escape from HEVC licensing specifically, but this is not to be read as if AVC licensing was unproblematic to its creators: FRAND licensing makes free software undistributable, and this impacts Mozilla. AV1 is intended for use in HTML5 web video and WebRTC together with the Opus audio format. The official announcement of AV1 came with the press release on the formation of the Alliance for Open Media on 1 September 2015. The Alliance's seven founding members – Amazon, Cisco, Google, Intel, Microsoft, Mozilla and Netflix – announced that the initial focus of the video format would in delivery of high-quality web video. The Alliance's motivations for creating AV1 included the high cost and uncertainty involved with the patent licensing of HEVC, the MPEG-designed codec expected to succeed AVC. With previous MPEG standards, the technology in the standard could be licensed from a single entity – MPEG-LA – but two years after the HEVC standard was finished, two patent pools had been formed with a third one on its way. In addition, various patent holders weren't offering patents via either pool, increasing uncertainty about HEVC's licensing. According to Microsoft's Ian LeGrow, an open-source, royalty-free technology was seen as the easiest way to eliminate this uncertainty around licensing. The negative effect of patent licensing on free and open-source software has also been cited as a reason for the creation of AV1. For example, building a H.264 implementation into Firefox would prevent it from being distributed free of charge since licensing fees would have to be paid to MPEG-LA. Free Software Foundation Europe has argued that FRAND patent licensing practices make the free software implementation of standards impossible due to various incompatibilities with free software licenses. The increased usage of AV1's predecessor VP9 is also attributed to confidence in the Alliance and development of AV1. The roots of the project precede the Alliance. Individual contributors started experimental technology platforms years before: Xiph's/Mozilla's Daala already published code in 2010, Google's experimental VP9 evolution project VP10 was announced on 12 September 2014, and Cisco's Thor was published on 11 August 2015. Building on the codebase of VP9, AV1 incorporates additional techniques, several of which were developed in these experimental formats. The first version 0.1.0 of the AV1 reference codec was published on 7 April 2016. Soft feature freeze was at the end of October 2017, but a few significant features were decided to continue developing beyond this. The bitstream format was projected to be frozen in January 2018; however, this was delayed due to unresolved critical bugs as well as last changes to transformations, syntax, the prediction of motion vectors, and the completion of legal analysis. The Alliance announced the release of the AV1 bitstream specification on 28 March 2018, along with a reference, software-based encoder and decoder. On 25 June 2018, a validated version 1.0.0 of the specification was released. On 8 January 2019 a validated version 1.0.0 with Errata 1 of the specification was released. Martin Smole from AOM member Bitmovin said that the computational efficiency of the reference encoder was the greatest remaining challenge after the bitstream format freeze. While still working on the format, the encoder was not targeted for productive use and didn't receive any speed optimizations. Therefore, it worked orders of magnitude slower than e.g. existing HEVC encoders. Development was shifted its focus towards maturing the reference encoder after the freeze. In March 2019, it was reported that the speed of the reference encoder was much faster, close to or within the same order of magnitude as usual encoders for other common formats. AV1 aims to be a video format for the web that is both state of the art and royalty free. The mission of the Alliance for Open Media is the same as that of the WebM project. To fulfill the goal of being royalty free, the development process is such that no feature is adopted before it has been independently double checked to not infringe on patents of competing companies. In cases where working around a patent-protected technique hasn't been possible, owners of relevant patents have been invited to join the Alliance, even if they were already members of another patent pool. For example, Alliance members Apple, Cisco, Google, and Microsoft are also licensors in MPEG-LA's patent pool for H.264. In addition, the Alliance has a legal defense fund to aid smaller Alliance members or AV1 licensees in case they're sued. This contrasts with its main competitor HEVC, for which a review of the intellectual property rights (IPR review) was not part of the standardization process. The latter reviewing practice is stipulated in the ITU-T's definition of an open standard. The possible existence of yet unknown patents has been a recurring concern in the field of royalty-free multimedia formats; the concern has been raised regarding AV1, and previously VP9, Theora and IVC. The problem of unforeseen patents is not unique to royalty-free formats, but it uniquely threatens their status as royalty-free. In contrast, IPR avoidance has not traditionally been a priority in MPEG's business model for royalty-bearing formats (although the MPEG chairman argues it has to change). Under patent rules adopted from the World Wide Web Consortium (W3C), technology contributors license their AV1-connected patents to anyone, anywhere, anytime based on reciprocity, i.e. as long as the user does not engage in patent litigation. As a defensive condition, anyone engaging in patent litigation loses the right to the patents of all patent holders. The pursuit of royalty-free web standards has historical precedence and can have many reasons. In 2007, the proposal for HTML5 video specified Theora as mandatory to implement. The reason given was that public content should be encoded in freely implementable formats, if only as a “baseline format”, and that changing such a baseline format later would be hard because of network effects. The Alliance for Open Media is a continuation of Google's efforts with the WebM project, which renewed the royalty-free competition after Theora had been surpassed by AVC. AVC is hard for (among others) Mozilla to support, the problem being that a per-copy royalty easily is unsustainable for software that is distributed free of charge (see FRAND § Excluding costless distribution). HEVC is likewise – an exception for freely distributed software has not been made by all licensors (see HEVC § Provision for costless software). The performance goals include "a step up from VP9 and HEVC" in efficiency for a low increase in complexity. NETVC's efficiency goal is 25% improvement over HEVC. The primary complexity concern is for software decoding, since hardware support will take time to reach users. However, for WebRTC, live encoding performance is also relevant, which is Cisco's agenda: Cisco is a manufacturer of videoconferencing equipment, and their Thor contributions aim at "reasonable compression at only moderate complexity". Feature wise, it is specifically designed for real-time applications (especially WebRTC) and higher resolutions (wider color gamuts, higher frame rates, UHD) than typical usage scenarios of the current generation (H.264) of video formats where it is expected to achieve its biggest efficiency gains. It is therefore planned to support the color space from ITU-R Recommendation BT.2020 and up to 12 bits of precision per color component. AV1 is primarily intended for lossy encoding, although lossless compression is supported as well. AV1-based containers have also been proposed as a replacement for JPEG, similar to Better Portable Graphics and High Efficiency Image File Format which wrap HEVC. AV1 is a traditional block-based frequency transform format featuring new techniques. Based on Google's VP9, AV1 incorporates additional techniques that mainly give encoders more coding options to enable better adaption to different types of input. Processing stages of an AV1 encoder with relevant technologies associated with each stage. The Alliance published a reference implementation written in C and assembly language (aomenc, aomdec) as free software under the terms of the BSD 2-Clause License. Development happens in public and is open for contributions, regardless of AOM membership. The development process was such that coding tools were added to the reference codebase as experiments, controlled by flags that enable or disable them at build time, for review by other group members as well as specialized teams that helped with and ensured hardware friendliness and compliance with intellectual property rights (TAPAS). When the feature gained some support in the community, the experiment was enabled by default, and ultimately had its flag removed when all of the reviews were passed. Experiment names were lowercased in the configure script and uppercased in conditional compilation flags. To better and more reliably support HDR and color spaces, corresponding metadata can now be integrated into the video bitstream instead of being signaled in the container. 10 ways for subpartitioning coding units – into squares (recursively), rectangles, or mixtures thereof ("T-shaped"). Frame content is separated into adjacent same-sized blocks referred to as superblocks. Similar to the concept of a macroblock, superblocks are square-shaped and can either be of size 128×128 or 64×64 pixels. Superblocks can be divided in smaller blocks according to different partitioning patterns. The four-way split pattern is the only pattern whose partitions can be recursively subdivided. This allows superblocks to be divided into partitions as small as 4×4 pixels. 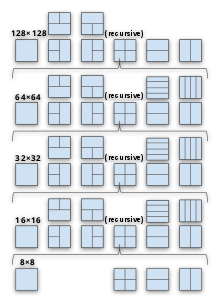 Diagram of the AV1 superblock partitioning. It shows how 128×128 superblocks can be split all the way down to 4×4 blocks. As special cases, 128×128 and 8×8 blocks can't use 1:4 and 4:1 splits, and 8×8 blocks can't use "T"-shaped splits. "T-shaped" partitioning patterns are introduced, a feature developed for VP10, as well as horizontal or vertical splits into four stripes of 4:1 and 1:4 aspect ratio. The available partitioning patterns vary according to the block size, both 128×128 and 8×8 blocks can't use 4:1 and 1:4 splits. Moreover, 8×8 blocks can't use "T" shaped splits. Two separate predictions can now be used on spatially different parts of a block using a smooth, oblique transition line (wedge-partitioned prediction). This enables more accurate separation of objects without the traditional staircase lines along the boundaries of square blocks. More encoder parallelism is possible thanks to configurable prediction dependency between tile rows (ext_tile). AV1 performs internal processing in higher precision (10 or 12 bits per sample), which leads to compression improvement due to smaller rounding errors in reference imagery. Predictions can be combined in more advanced ways (than a uniform average) in a block (compound prediction), including smooth and sharp transition gradients in different directions (wedge-partitioned prediction) as well as implicit masks that are based on the difference between the two predictors. This allows combination of either two inter predictions or an inter and an intra prediction to be used in the same block. A frame can reference 6 instead of 3 of the 8 available frame buffers for temporal (inter) prediction while providing more flexibility on bi-prediction (ext_refs). Warped motion as seen from the front of a train. The Warped Motion (warped_motion) and Global Motion (global_motion) tools in AV1 aim to reduce redundant information in motion vectors by recognizing patterns arising from camera motion. They implement ideas that were tried to be exploited in preceding formats like e.g. MPEG-4 ASP, albeit with a novel approach that works in three dimensions. There can be a set of warping parameters for a whole frame offered in the bitstream, or blocks can use a set of implicit local parameters that get computed based on surrounding blocks. Switch frames (S-frame) are a new inter-frame type that can be predicted using already decoded reference frames from a higher-resolution version of the same video to allow switching to a lower resolution without the need for a full keyframe at the beginning of a video segment in the adaptive bitrate streaming use case. Intra prediction consists of predicting the pixels of a given blocks only using information available in the current frame. Most often, intra predictions are built from the neighboring pixels above and to the left of the predicted block. The DC predictor builds a prediction by averaging the pixels above and to the left of block. Directional predictors extrapolate these neighboring pixels according to a specified angle. In AV1, 8 main directional modes can be chosen. These modes start at an angle of 45 degrees and increase by a step size of 22.5 degrees up until 203 degrees. Furthermore, for each directional mode, six offsets of 3 degree can be signalled for bigger blocks, three above the main angle and three below it, resulting in a total of 56 angles (ext_intra). To transform the error remaining after prediction to the frequency domain, AV1 encoders can use square, 2:1/1:2, and 4:1/1:4 rectangular DCTs (rect_tx), as well as an asymmetric DST for blocks where the top and/or left edge is expected to have lower error thanks to prediction from nearby pixels, or choose to do no transform (identity transform). It can combine two one-dimensional transforms in order to use different transforms for the horizontal and the vertical dimension (ext_tx). AV1 has new optimized quantization matrices (aom_qm). The eight sets of quantization parameters that can be selected and signaled for each frame now have individual parameters for the two chroma planes and can use spatial prediction. On every new superblock, the quantization parameters can be adjusted by signaling an offset. For the in-loop filtering step, the integration of Thor's constrained low-pass filter and Daala's directional deringing filter has been fruitful: The combined Constrained Directional Enhancement Filter (cdef) exceeds the results of using the original filters separately or together. It is an edge-directed conditional replacement filter that smoothes blocks with configurable (signaled) strength roughly along the direction of the dominant edge to eliminate ringing artifacts. There is also the loop restoration filter (loop_restoration) based on the Wiener filter and self-guided restoration filters to remove blur artifacts due to block processing. Film grain synthesis (film_grain) improves coding of noisy signals using a parametric video coding approach. Due to the randomness inherent to film grain noise, this signal component is traditionally either very expensive to code or prone to get damaged or lost, possibly leaving serious coding artefacts as residue. This tool circumvents these problems using analysis and synthesis, replacing parts of the signal with a visually similar synthetic texture, based solely on subjective visual impression instead of objective similarity. It removes the grain component from the signal, analyzes its non-random characteristics, and instead transmits only descriptive parameters to the decoder, which adds back a synthetic, pseudorandom noise signal that's shaped after the original component. Daala's entropy coder (daala_ec), a non-binary arithmetic coder, was selected for replacing VP9's binary entropy coder. The use of non-binary arithmetic coding helps evade patents, but also adds bit-level parallelism to an otherwise serial process, reducing clock rate demands on hardware implementations. This is to say that the effectiveness of modern binary arithmetic coding like CABAC is being approached using a greater alphabet than binary, hence greater speed, as in Huffman code (but not as simple and fast as Huffman code). AV1 also gained the ability to adapt the symbol probabilities in the arithmetic coder per coded symbol instead of per frame (ec_adapt). This list is no longer complete. It is being rewritten in prose. Daala Transforms were the major innovation behind the daala codec. They implement "lapped" discrete cosine and sine transforms that its authors describe as "better in every way" than the txmg set of transforms that prevailed in AV1. Both the txmg and daala_tx experiments have merged high and low bitdepth code paths (unlike VP9), but daala_tx achieved full embedding of smaller transforms within larger, as well as using fewer multiplies, which could have further reduced the cost of hardware implementations. The Daala transforms were kept as optional in the experimental codebase until late January 2018, but changing hardware blocks at a late stage was a general concern for delaying hardware availability. The integration of Daala's Perceptual Vector Quantization (PVQ) was interfering too much with testing and continuous integration. The Rate Distortion dist_8x8 heuristic aims to speed up the encoder by a sizable factor, PVQ or not, but PVQ was ultimately dropped. ANS was the other non-binary arithmetic coder, developed in parallel with Daala's entropy coder. Of the two, Daala EC was the more hardware friendly, but ANS was the fastest to decode in software. A first comparison from the beginning of June 2016 found AV1 roughly on par with HEVC, as did one using code from late January 2017. In April 2017, using the 8 enabled experimental features at the time (of 77 total), Bitmovin was able to demonstrate favorable objective metrics, as well as visual results, compared to HEVC on the Sintel and Tears of Steel animated films. A follow-up comparison by Jan Ozer of Streaming Media Magazine confirmed this, and concluded that "AV1 is at least as good as HEVC now". Ozer noted that his and Bitmovin's results contradicted a comparison by Fraunhofer Institute for Telecommunications from late 2016 that had found AV1 38.4% less efficient than HEVC, underperforming even H.264/AVC, and justified this discrepancy by having used encoding parameters endorsed by each encoder vendor, as well as having more features in the newer AV1 encoder. Tests from Netflix showed that, based on measurements with PSNR and VMAF at 720p, AV1 was about 25% more efficient than VP9 (libvpx). Similar conclusions with respect to quality were drawn from a test conducted by Moscow State University researchers, where VP9 was found to require 31% and HEVC 22% more bitrate than AV1 for the same level of quality. The researchers found that the used AV1 encoder was operating at a speed “2500–3500 times lower than competitors”, while admitting that it has not been optimized yet. In a comparison of AV1 against H.264 (x264) and VP9 (libvpx), Facebook showed about 45–50% bitrate savings over H.264 and about 40% over VP9 when using a constant quality encoding mode. Decoding performance was at about half the speed of VP9 according to internal measurements from 2017. AOMedia provides a list of test results on their website. AV1 defines three profiles for decoders which are Main, High, and Professional. The Main profile allows for a bit depth of 8- or 10-bits per sample with 4:0:0 (greyscale) and 4:2:0 chroma sampling. The High profile further adds support for 4:4:4 chroma sampling. The Professional profile extends capabilities to full support for 4:0:0, 4:2:0, 4:2:2 and 4:4:4 chroma sub-sampling with 8, 10 and 12 bit color depths. AV1 defines levels for decoders with maximum variables for levels ranging from 2.0 to 7.3. Example resolutions would be 426×240@30 fps for level 2.0, 854×480@30 fps for level 3.0, 1920×1080@30 fps for level 4.0, 3840×2160@60 fps for level 5.1, 3840×2160@120 fps for level 5.2 and 5.3,[further explanation needed] and 7680×4320@120 fps for level 6.2. Level 7 has not been defined yet. ISO Base Media File Format: The ISOBMFF containerization spec by AOMedia was the first to be finalized and the first to gain adoption. This is the format used by YouTube. Matroska: Version 1 of the Matroska containerization spec was published in September 2018. However, arguably breaking changes continued into October, and a new version, or finalization, is yet to be announced as of December. WebM: As a matter of formality, AV1 has not been sanctioned into the subset of Matroska known as WebM as of late 2018. On2 IVF: This format was inherited from the first public release of VP8, where it served as a simple development container. rav1e also supports this format. Pre-standard WebM: Libaom featured early support for WebM, before Matroska containerization was specified, but has been changed to conform. YouTube has begun rolling out AV1, starting with its AV1 Beta Launch Playlist. According to the description, the videos are (to begin with) encoded at high bitrate to test decoding performance, and YouTube has “ambitious goals” for rolling out AV1. Netflix “expects to be an early adopter of AV1”. Following very positive own test results, Facebook said to gradually roll out AV1 as soon as browser support emerges, starting with their most popular videos. Libaom is the reference implementation. It includes an encoder (aomenc) and a decoder (aomdec). As the former research codec, it has the advantage of being made to justifiably demonstrate efficient use of every feature, but at the general cost of encoding speed. At feature freeze, the encoder had become problematically slow, but speed optimizations with negligible efficiency impact have continued to be made also after that. rav1e is an encoder written in Rust and assembly. rav1e takes the opposite developmental approach to Aomenc: start out as the simplest (therefore fastest) conforming encoder, and then improve efficiency over time while remaining fast. The SVT-AV1 Encoder is an open-source encoder first released by Intel in February 2019 that is designed especially for usage on data center servers based on Intel Xeon processors. dav1d is a decoder written in C99 and assembly focused on speed (via parallelism) and portability. The first official version (0.1) was released in December 2018. Firefox is planning to switch from Libaom to dav1d as a default decoder. Version 0.2 was released in March 2019, with users able to "safely use the decoder on all platforms, with excellent performance", according to the developers. Several other parties have announced to be working on encoders, including EVE for AV1 (in beta testing), NGCodec, and Socionext. - Support introduced in Windows 10 October 2018 Update (1809) with AV1 Video Extension beta add-on. - Supported on Universal Windows Platform apps like Microsoft Edge and Films & TV. Unsupported as of macOS Mojave. Currently, no GPU supports hardware acceleration. supports decoding, from Chrome OS 70 onward Supported since Android Q beta. Unsupported as of iOS 12. Several Alliance members demonstrated AV1 enabled products at IBC 2018, including Socionext's hardware accelerated encoder. According to Socionext, the encoding accelerator is FPGA based and can run on an Amazon EC2 F1 cloud instance, where it runs 10 times faster than existing software encoders. According to Mukund Srinivasan, chief business officer of AOM member Ittiam, early hardware support will be dominated by software running on non-CPU hardware (such as GPGPU, DSP or shader programs, as is the case with some VP9 hardware implementations), as fixed-function hardware will take 12–18 months after bitstream freeze until chips are available, plus 6 months for products based on those chips to hit the market. The bitstream was finally frozen on 28 March 2018, meaning chips could be available sometime between March and August 2019. According to the above forecast, products based on chips could then be on the market at the end of 2019 or the beginning of 2020. In March 2019, Luxembourg-based Sisvel announced the formation of patent pools for AV1 and VP9. Members of the pools included JVC Kenwood, NTT, Orange S.A., Philips, and Toshiba, all of whom were also licensing patents to the MPEG-LA for either the AVC, DASH, or the HEVC patent pools. Sisvel announced it would demand €0.32 for display devices and €0.11 for non-display devices using AV1, but would not seek royalties for encoded content. At the time of the announcement, a list of patents owned by Sisvel was not publicly available. However, Sisvel's CEO stated in an interview that such a list would be posted on Sisvel's website before any licensing demands were sent out. As of 8th April 2019, the Alliance for Open Media has made a press release, which reiterated the commitment to their royalty-free patent license, and made mention of their "AOMedia patent defense program to help protect AV1 ecosystem participants in the event of patent claims", but did not mention the Sisvel claim by name. The AV1 Image File Format (AVIF) is a specification for storing images or image sequences compressed with AV1 in the HEIF file format. AVIF files conform to the HEIC specification and support features like High Dynamic Range (HDR) and wide color gamut (WCG). On December 14, 2018 Netflix published the first .avif sample images, and support was added in VLC. Microsoft also announced support with the Windows 10 "19h1" preview release, including File Explorer, Paint and multiple APIs, together with sample images. Mozilla is also working on support for the new image format in Firefox. ^ "Release AV1 Bitstream & Decoding Process Specification (v1.0.0-errata1)". Github.com. 9 January 2019. Retrieved 31 March 2019. ^ a b c d e f How to use AV1 with open source tools, Videolan's Jean-Baptiste Kempf on using AV1 with open source tools, 2018-12-01. ^ a b Yoshida, Junko (28 March 2018). "Streaming Group to Pit AV1 Against H.265". EE Times. AspenCore, Inc. Retrieved 4 April 2019. ^ a b "Why is FRAND bad for Free Software?". 20 June 2016. Retrieved 8 April 2019. As Free Software gives each user the freedom to redistribute the software itself, keeping track and collecting royalties based on distributed copies is also, in practice, impossible. ^ a b "OpenH264 Now in Firefox". 14 October 2014. Retrieved 8 April 2019. Because H.264 implementations are subject to a royalty bearing patent license and Mozilla is an open source project, we are unable to ship H.264 in Firefox directly. We want anyone to be able to distribute Firefox without paying the MPEG LA. ^ Tsahi Levent-Levi (2 April 2018). "AV1 Specification Released: Can we kiss goodbye to HEVC and royalty bearing video codecs?". BlogGeek.me. Retrieved 19 December 2018. AV1 for video coding is what Opus is for audio coding. ^ a b Shankland, Stephen (1 September 2015). "Tech giants join forces to hasten high-quality online video". CNET. CBS Interactive Inc. Retrieved 15 April 2019. ^ a b Bright, Peter (1 September 2015). "Microsoft, Google, Amazon, others, aim for royalty-free video codecs". Ars Technica. Condé Nast. Retrieved 5 April 2019. ^ Rosenberg, Jonathan (28 March 2018). "Introducing the Industry's Next Video Codec: AV1". Cisco Blogs. Cisco Systems. Retrieved 15 April 2019. ^ Stephen Shankland (12 September 2014). "Google's Web-video ambitions bump into hard reality". CNET. Retrieved 13 September 2014. ^ Romain Bouqueau (12 June 2016). "A view on VP9 and AV1 part 1: specifications". GPAC Project on Advanced Content. Retrieved 1 March 2017. ^ Shilov, Anton (30 March 2018). "Alliance for Open Media Releases Royalty-Free AV1 1.0 Codec Spec". AnandTech. Retrieved 2 April 2018. ^ Larabel, Michael (25 June 2018). "AOMedia AV1 Codec v1.0.0 Appears Ready For Release". Phoronix. Retrieved 27 June 2018. ^ a b c "AV1 Bitstream and Decoding Process Specification" (PDF). Alliance for Open Media. Retrieved 1 April 2019. This version 1.0.0 with Errata 1 of the AV1 Bitstream Specification corresponds to the Git tag v1.0.0-errata1 in the AOMediaCodec/av1-spec project. Its content has been validated as consistent with the reference decoderprovided by libaom v1.0.0-errata1. ^ Hunter, Philip (15 February 2018). "Race on to bring AV1 open source codec to market, as code freezes". Videonet. Mediatel Limited-GB. Retrieved 19 March 2018. ^ a b Ozer, Jan (4 March 2019). "Good News: AV1 Encoding Times Drop to Near-Reasonable Levels". Retrieved 4 March 2019. ^ a b c d e f Frost, Matt (31 July 2017). "VP9-AV1 Video Compression Update". Retrieved 21 November 2017. The mission of the Alliance for Open Media remains the same as the mission of the WebM project that we launched back in 2010. (…) Obviously, if we have an open source codec, we need to take very strong steps, and be very diligent in making sure that we are in fact producing something that's royalty free. So we have an extensive IP diligence process which involves diligence on both the contributor level – so when Google proposes a tool, we are doing our in-house IP diligence, using our in-house patent assets and outside advisors – that is then forwarded to the group, and is then again reviewed by an outside counsel that is engaged by the alliance. So that's a step that actually slows down innovation, but is obviously necessary to produce something that is open source and royalty free. ^ a b c d Jan Ozer (28 March 2018). "AV1 Is Finally Here, but Intellectual Property Questions Remain". Streaming Media Magazine. Retrieved 21 April 2018. ^ Baumgartner, Jeff (11 April 2018). "NAB 2018: Hardware Support a Big Step Ahead for AV1". Multichannel. Publishing Limited Quay House. Retrieved 4 April 2019. ^ Jan Ozer (June 2016). "VP9 Finally Comes of Age, But Is it Right for Everyone?". Retrieved 21 April 2018. ^ Silvia Pfeiffer (December 2009). "Patents and their effect on Standards: Open video codecs for HTML5". Retrieved 21 April 2018. ^ Leonardo Chiariglione (28 January 2018). "A crisis, the causes and a solution". Retrieved 21 April 2018. two tracks in MPEG: one track producing royalty free standards (Option 1, in ISO language) and the other the traditional Fair Reasonable and Non Discriminatory (FRAND) standards (Option 2, in ISO language). (…) The Internet Video Coding (IVC) standard was a successful implementation of the idea (…). Unfortunately 3 companies made blank Option 2 statements (of the kind “I may have patents and I am willing to license them at FRAND terms”), a possibility that ISO allows. MPEG had no means to remove the claimed infringing technologies, if any, and IVC is practically dead. ^ Leonardo Chiariglione (28 January 2018). "A crisis, the causes and a solution". Retrieved 21 April 2018. How could MPEG achieve this? Thanks to its “business model” that can simply be described as: produce standards having the best performance as a goal, irrespective of the IPR involved. ^ Wium Lie, Håkon (29 March 2007). "Proposal for the HTML 5 video element (Google TechTalks)". Google Video, later YouTube. Retrieved 3 January 2019. Flash is today the baseline format on the web. The problem with Flash is that it's not an open standard. It's a proprietary format, it hasn't been documented, and it probably requires the payment of licenses if you are going to (…) write software for it (…) The web community has always been based on open standards. This has been what the web was founded on, where HTML started. That's why we developed the PNG image format – we wanted a freely implementable open standard to hold the content we are putting out there. Our content is too valuable to put into some locked format. This goes back all the way to SGML, in which the mantra was “own your data”. (…) If we look at open standards for video today (…), there is one which I believe is the right one, and that's called Ogg Theora. ^ "An Invisible Tax on the Web: Video Codecs". 11 July 2018. Retrieved 4 January 2019. Mozilla uses Cisco’s OpenH264 in Firefox. If not for Cisco’s generosity, Mozilla would be paying estimated licensing fees of $9.75 million a year. ^ Sebastian Grüner (19 July 2016). "Der nächste Videocodec soll 25 Prozent besser sein als H.265" (in German). golem.de. Retrieved 1 March 2017. ^ Shankland, Stephen (19 January 2018). "Photo format from Google and Mozilla could leave JPEG in the dust". CNET. CBS Interactive. Retrieved 28 January 2018. ^ Jan Ozer, 26 May 2016: What Is VP9? ^ "LICENSE - aom - Git at Google". Aomedia.googlesource.com. Retrieved 26 September 2018. ^ a b Ozer, Jan (30 August 2017). "AV1: A status update". Streaming Media Magazine. Retrieved 14 September 2017. ^ a b c d e f g h i j k l m n "Analysis of the emerging AOMedia AV1 video coding format for OTT use-cases" (PDF). Archived from the original (PDF) on 20 September 2017. Retrieved 19 September 2017. ^ a b c d e f g h i Ian Trow (16 September 2018). Tech Talks: Codec wars (Recorded talk). IBC 2018 Conference. 28 minutes in. Retrieved 18 September 2018. ^ a b Jan Ozer (11 October 2017). "Demuxed: A Video Engineer's Nirvana". Streaming Media Magazine. Retrieved 10 February 2019. ^ Joshi, Urvang; Mukherjee, Debargha; Han, Jingning; Chen, Yue; Parker, Sarah; Su, Hui; Chiang, Angie; Xu, Yaowu; Liu, Zoe (19 September 2017). "Novel inter and intra prediction tools under consideration for the emerging AV1 video codec". Applications of Digital Image Processing XL, proceedings of SPIE Optical Engineering + Applications 2017. International Society for Optics and Photonics. 10396: 103960F. doi:10.1117/12.2274022. ^ Han, Jingning; Saxena, Ankur; Melkote, Vinay; Rose, Kenneth (29 September 2011). "Jointly Optimized Spatial Prediction and Block Transform for Video and Image Coding" (PDF). IEEE Transactions on Image Processing. Retrieved 12 February 2019. ^ "Mozilla shares how AV1, the new open source royalty-free video codec, works". 12 November 2018. Retrieved 21 December 2018. ^ "Into the Depths:The Technical Details Behind AV1" (PDF). 31 July 2018. Retrieved 21 December 2018. ^ "NEW_MULTISYMBOL: Code extra_bits using multi-symbols". Git at Google. Alliance for Open Media. Retrieved 25 May 2018. ^ "Add support to recursive transform block coding". Git at Google. Alliance for Open Media. Retrieved 25 May 2018. ^ "next generation video: Introducing Daala". people.xiph.org. 30 May 2013. Retrieved 30 October 2018. ^ "The Future of Video Codecs: VP9, HEVC, AV1". 2 November 2017. Retrieved 30 January 2018. ^ Sebastian Grüner (9 June 2016). "Freie Videocodecs teilweise besser als H.265" (in German). golem.de. Retrieved 1 March 2017. ^ "Netflix on AV1". Streaming Learning Center. 30 November 2017. Retrieved 8 December 2017. ^ "MSU Codec Comparison 2017" (PDF). 17 January 2018. Retrieved 9 February 2018. ^ Ozer, Jan (30 January 2018). "AV1 Beats VP9 and HEVC on Quality, if You've Got Time, says Moscow State". Streaming Media Magazine. Retrieved 9 February 2018. ^ a b Baumgartner, Jeff (8 February 2019). "Facebook: Tests Show AV1 Streaming Performance Is Exceeding Expectations". Multichannel. Retrieved 10 February 2019. ^ "AV1 Codec ISO Media File Format Binding". cdn.rawgit.com. Retrieved 14 September 2018. ^ "AOM AV1 codec mapping in Matroska/WebM". 3 December 2018. Retrieved 19 December 2018. ^ "Matroska AV1 support". 12 September 2018. Retrieved 19 December 2018. ^ "WebM Container Guidelines". 28 November 2017. Retrieved 19 December 2018. ^ "Simple Encoder". 18 May 2010. Retrieved 17 January 2019. IVF files will not generally be used by your application. ^ a b "The fastest and safest AV1 encoder". Retrieved 9 April 2018. ^ "WebM output in libaom". 1 November 2018. Retrieved 19 December 2018. ^ a b "Linux Conference Australia 2019: The AV1 Video Codec". 24 January 2019. Retrieved 5 February 2019. We have been focusing on freezing the bitstream and getting the quality, not necessarily making things fast. This is a graph of the [encoding] speed of AV1 over its development process. You can se that as we near the end of that process, we started making things faster again, and it's now two orders of magnitude faster than it was at its slowest point. So that's going to improve. And this is a corresponding graph of the quality. (…) So you can see that even as it has continued to get much faster, the quality hasn't really gone down. (…) We wanted to approach this from the other end, so we started an encoder of our own, called rav1e, and the idea is that we would start out always being fast, and then try to make it better over time. ^ Armasu, Lucian (4 February 2019). "Intel Releases Open Source Encoder for Next-Gen AV1 Codec". Tom's Hardware. Retrieved 13 February 2019. ^ "Introducing dav1d: a new AV1 decoder". 1 October 2018. Retrieved 6 January 2019. ^ Kempf, Jean-Baptiste (11 December 2018). "First release of dav1d, the AV1 decoder". personal website of Jean-Baptiste Kempf. Retrieved 3 February 2019. ^ "Bug 1493397 (dav1d) – Switch AV1 implementation to dav1d". Mozilla bug tracking system. 1 February 2019. Retrieved 3 February 2019. ^ Cimpanu, Catalin (29 January 2019). "Firefox 65 released with AV1 and WebP support". ZDNet. Retrieved 13 February 2019. ^ "Chrome 70 Arrives With Option To Disable Linked Sign-Ins, PWAs On Windows, and AV1 Decoder". Slashdot. 16 October 2018. Retrieved 13 February 2019. ^ "How to Play AV1 Videos on YouTube in Chrome 70, Firefox, Vivaldi, Opera". Techdows. 19 October 2018. Retrieved 26 February 2019. ^ "Opera 57 with smarter news and Netflix recommendations". Opera Desktop. 28 November 2018. Retrieved 13 December 2018. ^ Tung, Liam (12 February 2018). "VideoLAN: VLC 3.0's huge update brings Chromecast support, 360-degree video". ZDNet. Retrieved 13 February 2019. ^ Larabel, Michael (20 March 2018). "GStreamer 1.14.0 Released With WebRTC Support, AV1 Video & Better Rust Bindings". Phoronix. Retrieved 13 February 2019. ^ "Time to Start Testing: FFmpeg Turns 4.0 and Adds AV1 Support". Streaming Media Magazine. 27 September 2018. Retrieved 13 February 2019. ^ Serea, Razvan (20 March 2018). "MediaInfo 18.03". Neowin. Retrieved 3 May 2018. ^ "Microsoft Launches Free AV1 Video Codec For Windows 10". Slashdot. 10 November 2018. Retrieved 13 February 2019. ^ "Introducing Android Q Beta". Android Developers Blog. Retrieved 15 March 2019. ^ a b Ozer, Jan (28 March 2019). "Sisvel Announces Patent Pools for VP9 and AV1". Stream Learning Center. Retrieved 4 April 2019. ^ Cluff, Phil (28 March 2019). "Did Sisvel just catch AOM with their patents down?". Mux.com. Retrieved 4 April 2019. ^ Ozer, Jan (28 March 2019). "No Content Royalties in Sisvel VP9/AV1 Patent Pools". Streaming Media. Information Today Inc. Retrieved 4 April 2019. ^ "Alliance for Open Media Patent License 1.0". The Alliance for Open Media. Retrieved 15 April 2019. ^ "The Alliance for Open Media Statement". The Alliance for Open Media. Retrieved 12 April 2019. ^ "AV1 Image File Format (AVIF)". aomediacodec.github.io. Retrieved 25 November 2018. ^ Abrams, Lawrence (28 December 2018). "Microsoft is Adding AVIF Image Support to Windows 10". BleepingComputer. Retrieved 13 February 2019. Wikimedia Commons has media related to AV1.